WP Comments Remover is a small plugin for WordPress, I develop it because I needed and easy way to remove comments from WordPress. After a search in WordPress plugin repository, I was unable to find a plugin that can remove or delete pending comments base on a keyword, there are some great plugins to delete comments and I did check some of them. What WP Comments Remover do? 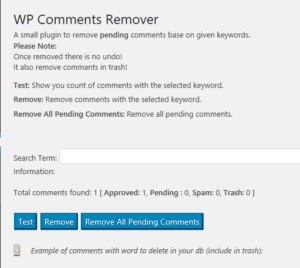 With WP Comments Remover plugin you can remove pending comments using a keyword, you can test how many pending comments there are for that keyword before removing them. Search pending comments using keyword. Remove pending comments using keyword. Remove all pending comments with one click. WordPress plugin repository under WP Comments Remover. You should have received a copy of the GNU General Public License along with this program; if not, write to the Free Software Foundation, Inc., 51 Franklin St, Fifth Floor, Boston, MA 02110-1301 USA.